The rumored HTC One Max (HTC T6) has been officially announced by HTC, but new details from claim that AT&T will be one of the carriers in the US to offer the over-sized phones. 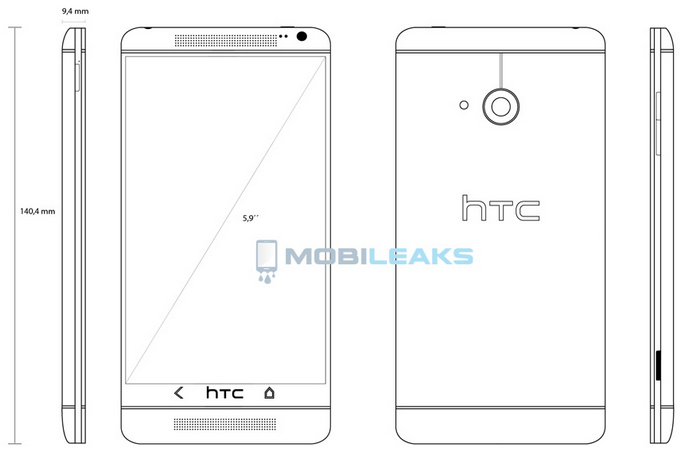 A leaked sketch of the HTC One Max (pictures above) suggest the device will look and feel the same as the HTC One while device specifications are expected to include a 5.9-inch 1080p display, 2.3GHz Qualcomm Snapdragon 800 processor, 3,300mAh battery, BoomSound speakers, and an UltraPixel camera sensor. Rumors have suggested that the HTC One Max will be unveiled during the second half of Q3, so don’t expect the HTC One Max to show up at your local AT&T store for at least another 2 to 3 months.